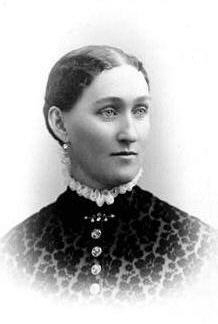 Sarah Farr Smith was born on October 30, 1849, to Lorin and Nancy Farr. Her mother was a charter member of the Female Relief Society and her father was one of the Prophet Joseph Smith’s closest friends. Within a year of their arrival in the Salt Lake Valley, they were called to colonize an area that became known as Ogden, and as a two-month-old baby, Sarah traveled with her parents and two other siblings to their new settlement. Her father lived the principle of plural marriage and married additional wives. He became the first mayor of Ogden and president of the Weber Stake, so Sarah’s home was full of many children and visitors, including Native Americans who pitched their tents in the Farr backyard. Sarah married John Henry Smith on October 20, 1866, a few days before her seventeenth birthday. He was one of the sons of George A. Smith. Together they had eleven children, the first eight were boys. Three of these sons died in infancy. Her son George Albert Smith later became eighth president of The Church of Jesus Christ of Latter-day Saints. They first made their home in Provo, Utah, but later moved to Salt Lake City. Sarah often managed the home alone because her husband served two missions, served as assistant clerk to the territorial House of Representatives, and became a member of the Quorum of the Twelve Apostles. He married a second wife prior to his call. Sarah often traveled with her husband or on her own to visit families. She suffered with high blood pressure. She died on February 4, 1921, nine years after her husband died. This page was last edited on 1 February 2017, at 15:19.